Source: Phipps & Bird, Inc.
Each bank may be programmed with paddle speeds from 5 to 300 rpm in 1-rpm increments. The stirrer may be run sequentially through the memory banks, independently in any one of the memories, or continously at a selected speed. Turning the stirrer off does not erase the programmed information. 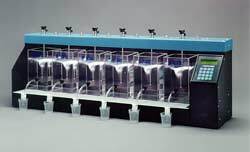 It permits automatic transitioning from a fast mix/short run to a slow mix/long run, or any combination of speeds and times desired to replicate actual plant conditions and operation. Six B-KER2 square, acrylic, 2-liter jar testing jars, along with a dust cover and a one-year manufacturer's warranty. , 1519 Summit Ave., Richmond, VA 23221-0475. Tel: 800-955-7621; Fax: 804-254-2955.